This old European-cut diamond (0.69, VS2, J) diamond solitaire estate ring is simple, yet fabulous. This 14kt rose gold mounting has intricate engravings along the ring shank. 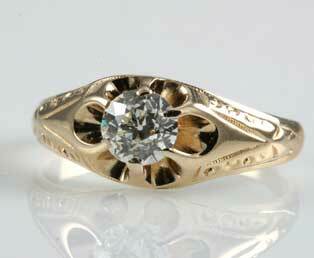 Six prongs hold this solitaire stone. Old European diamonds were the transitional diamond cut between old mine cut diamonds and brilliant cut diamonds. They were known for their rounded girdle and exceptional reflection under dim light. European-cut diamonds were the most common diamond cut between 1900 to 1920.